Preheat the oven to 425°F. Spread the drained chickpeas out onto paper towels and pat completely dry. Toss the chickpeas in a small bowl with the olive oil and spices. Spread them out onto a sheet pan in one, even layer. Roast for 25 minutes until crispy. Let cool before consolidating. Heat a large, heavy-bottom pot (or Dutch oven) over medium heat. Add enough olive oil to coat the bottom of the pot. Once the oil is hot, add the onions and a good pinch of salt. Let sauté for about 6 minutes, stirring often, or until tender and slightly caramelized. Stir in the garlic and ginger. Cook for another minute. Add the carrots. Cook for 2-3 minutes. Lastly, stir in the turmeric, harissa powder, and cardamom. Pour in the coconut milk and chicken stock. Whisk until smooth. Bring the liquid to a simmer over medium heat. Reduce the heat to medium-low and let the soup simmer for about 15 minutes, stirring often. Stir in the shredded chicken and warm through. Lastly, stir in the lime juice. Taste the soup and season with more salt as needed. 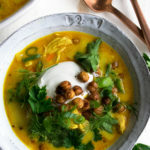 Ladle the soup into bowls and garnish with a dollop of greek yogurt, lots of parsley leaves, fresh dill leaves, sliced green onions, the crispy chickpeas, and a squeeze of lime juice.